During the planning, discussing and execution of a project you may need to prepare a presentation using project views such as the Gantt Chart, Multiproject Dashboard or Resource Usage View. It’s easy do with ConceptDraw PROJECT ! First you need to set your screen up according to the presentations needs. For example, hide some columns, close Panels, and change the timescale. Then switch to the Reports tab and find the Presentation group on the toolbar. Press the Capture slide button. The slide will appear in the pop-up Slide Preview panel. Pic. 1. ConceptDraw PROJECT window with Slide Preview panel. You can then switch to another view and capture a new slide. Manage your slides in the Slide Preview panel using the context menu. Once you have all slides you need, you can output them into a PowerPoint Presentation. Pic. 2. 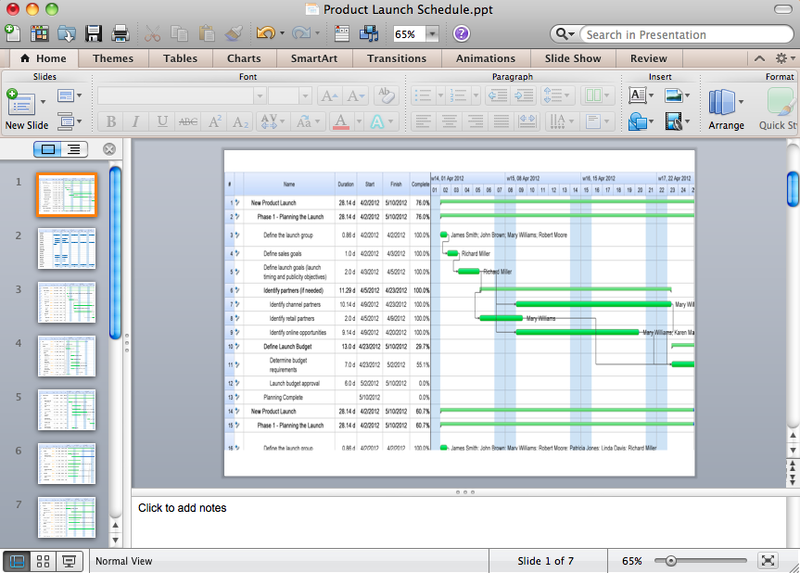 PowerPoint presentation of a Gantt chart. Should you want to use images instead of the presentation software, use the PNG button. You’ll get a set of images as a result. Column chart templates from ConceptDraw collection can help you find the best visual depiction for you data. You can easily modify column chart templates according to data you want to visualize. To design line and scatter charts use ConceptDraw DIAGRAM v12 diagramming and vector drawing software extended with Line Graphs solution from Graphs and Charts area of ConceptDraw DIAGRAM v12 Solution Park. (Line chart, scatter chart, 2d chart). Users new to ConceptDraw PROJECT v9 will find the Basic lessons an essential platform for familiarizing themselves with the program′s functions. This video lesson will teach you how to set up task trees and dependencies. Activity on Node Network Diagramming Tool - Activity Network and Project Evaluation and Review Technique, or PERT, charts are a way of documenting and analyzing the tasks in a project. This sample shows the Activity on node network diagramming method. It was created in ConceptDraw DIAGRAM v12 diagramming and vector drawing software using the Seven Management and Planning Tools solution from the Management area of ConceptDraw Solution Park. ConceptDraw MINDMAP v10 extended with Presentation Exchange solution allows you to create a traditional PowerPoint Presentation from your mind maps.